Wanting to treat your home to a deep clean? A REAL DEEP CLEAN is a whole day’s work. A day of getting down and dirty and burning so many calories the only matching equivalent could be compared to running half a marathon and your house would be dirty still so best crack on! Pick a day when the weather is nice to get yourself in the mood! Open up all the windows and doors if you can to allow your place to air. Put your scrag rags on and turn the music up (some cheesy 80’s music that you can sing along to is preferable). Take all the window nets and curtains down, strip all the beds and chuck it all next to the washing machine. Put your first load in to wash and as each loads finishes, hang it up to dry and put the next load in until it’s done. Don your rubber gloves, use your cleaning agent to squirt the bathroom tiles, shower and sink and then bleach your loo. Whilst your cleaning agent is soaking the bathroom grime down, get a bowl of hot water with a touch of bi-carb and some washing up liquid. Use this with a sponge to clean all your window frames, followed by your choice of window cleaner to clean the glass after. If you can’t get your window smear free use a bit of newspaper to finish off. Head back to the bathroom and rinse off your cleaning agent to leave a sparkling finish. Move all your nik naks, ornaments and items of all surfaces in the house (except the kitchen) dust, clean and polish (putting everything back in a neat order of course) Hoover from top to bottom, moving all the furniture if you can and use the extending nozzle and brush clean those skirting boards and get in all the nooks and crannies. Last but not least, the kitchen! Your washing pile should have diminished by now and be hanging out to dry. So put your oven cleaner in as most take half an hour to activate. Do all you’re washing up and clean your kitchen except the sink and floor. Don’t forget to clean the bin and under all those kitchen items too. Clean your cooker and then mop your floor! Iron and re-hang your curtains and make the beds! Shower, glass of wine and order a takeout as you will be knackered by now! 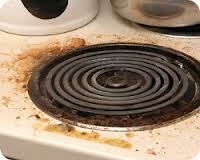 How to prepare for an end of tenancy clean!